So we can all agree that when you first spotted a suited and booted adult travelling to work on a motorised scooter you laughed it off as something you could never see yourself doing, but let’s be real; electric scooters for commuters are an all-round great purchase. They’re city friendly, environmentally friendly, and low maintenance. For commuters the ideal electric scooter is affordable and lightweight, especially if your journey involves public transport – folding scooters are a great option here too. 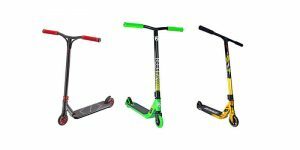 You have lots of things to consider when purchasing an electric scooter, i.e. 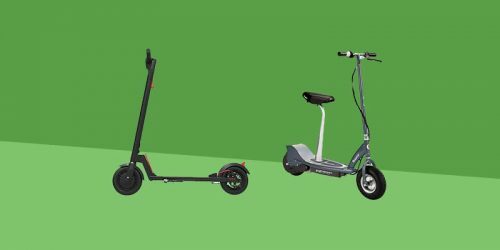 top speed, charging time, pricing and comfort, and there are many electric scooters for commuting, but there are only a few which we think are the best out there. Ultimately you certainly don’t want to waste your money on something that can’t get the job done properly. So here is a list of the best electric scooters for commuting that I think are worth spending your hard earned money on, and why I think so. 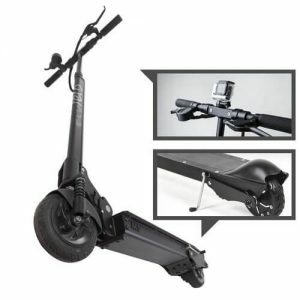 Read our full Swagtron Swagger review for a more in depth look at the e-scooter. 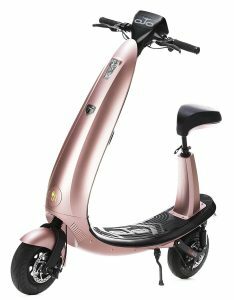 If you’re looking for a cheap and cheerful scooter you can’t go wrong with the SWAGTRON Swagger High Speed Adult Electric Scooter. It can do between 4 – 15 miles on a single charge depending on the journey. 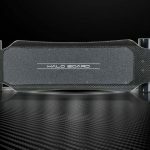 The carbon fibre frame can hold up to 250lbs and the charge time is 1.5 hours. It has an LED headlight for visibility and built in cruise control for those simple journeys to and from work. The built in digital crystal display shows speed, distance and battery life. This scooter works well for adults of all heights, and the tallest I’ve seen someone comfortably ride it is 6’2. 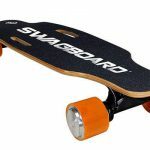 Overall its suspension could be better, as bumpier roads become a problem for the SWAGTRON, both in terms of comfort and durability. Also it may struggle on some intense uphill journeys, but this is a problem for many electric scooters. At the end of the day this scooter is for those who want to save money and go for the cheaper option, it has great specs for a scooter of this price range and due to that I can’t fault it massively. I would personally recommend it to anyone looking for a simple electric scooter or thinking about going for this as your first motorized scooter. Read our full Razor E300 Review for a much more in depth look at the pros and cons of this electric scooter. The Razor E300 is sort of a mixture between a kids scooter and an adult scooter. 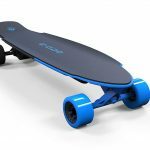 It has a maximum rider weight of 220lbs and is just as comfortable for a fully grown 6ft adult to ride as it is a child. The E300 uses a chain driven motor and a twist grip acceleration control with a hand operated rear brake. It has a super sized deck and extra wide pneumatic tires for extra comfort and control. 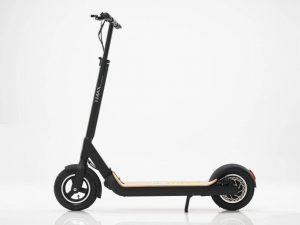 This scooter’s great selling point is its price, it’s great value for money when taking into consideration its top speed and good range for quick commutes, yet it can be found for less than $200. The super sized deck and wide tires make it good off road for those tough commutes. Despite not being designed quite as well as the other scooters on the list, this would still comfortably do the job and is probably the cheapest way to start scooting to work. The Razor E300 also made it onto our list of the best off road electric scooters because of it’s versatility and excellent value for money. Next comes a personal favourite of mine, built with perfectionism and care, the URB-E Folding Electric Scooter comes to you from a company who’s CTO was previously a lead engineer at Porsche. This product is made in America – specifically California – and has a frame that is built with aircraft grade aluminum and carbon fibre, so it’s lightweight, coming in at just 35lbs, and yet you can throw it around without worrying about dents. The URB-E is great for your commute to work regardless of terrain; it has a powerful motor, 10” pneumatic tires perfect for traction, amazing torque and a coilover shock suspension system. It’s good on uphill journeys due to its acceleration and torque, and will do up to an 18% gradient. The tires are made out of rubber and use a never flat technology, so there is no need to inflate them. To top it off this product has a 1 year warranty. A downside is that you cannot pedal once the charge has run out, this is obviously a problem if you’re on a long journey and the battery dies halfway in, but my advice is plan ahead! It takes a while to get over the unorthodox shape, but once you get into it you realise what a reliable, robust, and fun scooter it is.The ability for it to ride off road just as easily as it works on tarmac means you can easily cut off time from practically any commute. The URB-E has a range of around 20 miles and a quick charge time so you’ll never be without your URB-E for long. 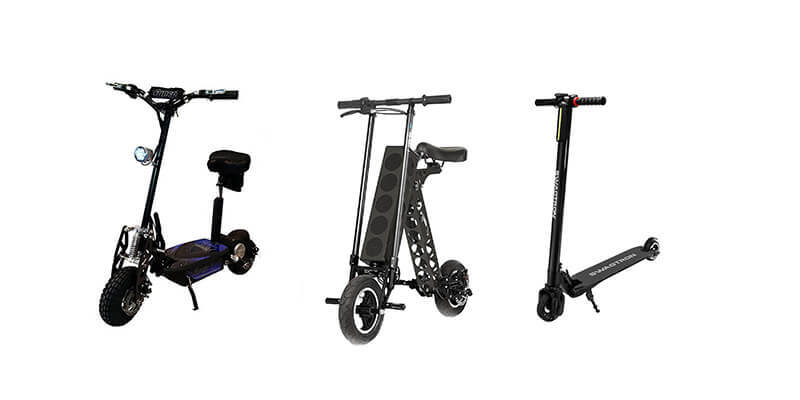 The only other negative we can see is the price, but for such as well constructed and versatile e-scooter we think this is very fair. 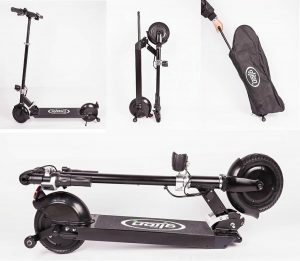 Read our full Glion Dolly Electric Scooter Review for a more in depth look at why the Glion Dolly is one of our favorite electric scooters available today. The Glion Dolly is a premium scooter designed specifically for adults and is aimed at the commuting market. 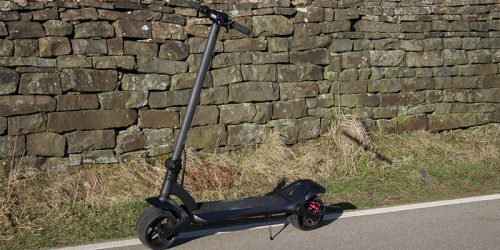 It could easily go in the ‘Best Electric Kick Scooters’ section but one of its stand out selling points is the ease and simplicity of its folding feature, so I decided to put it here. It’s an electric stand up scooter that has the ability to be folded down and pulled along like a suitcase for easy commuting. The design is patented and also includes the ability for it to be stood upright so you can store it anywhere you like with ease. It has a 250W DC brushless motor with an electronic anti lock maintenance free braking system. This allows it to reach speeds of 15 mph. What makes this battery really stand out is the fact that it can be fully charged and discharged over 1000 times, which is said to be 3 to 5 years, before it needs to be replaced or a new scooter bought. The Glion Dolly is also incredibly light, at just 28 lbs as it’s made from an aircraft grade aluminum alloy. The Glion Dolly feels like one incredibly made scooter, built with commuting in mind, we feel they’ve hit the nail on the head. With a folding time of 1 second and an easy, smooth process of transportation and storage for those subway parts of your journey, at those points you forget it’s a scooter rather than a small suitcase. 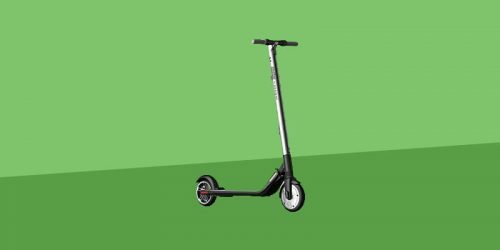 I’m happy to pay what I think is a very reasonable price for this scooter, and I’d go as far as to say it’s one of the best electric scooters on the market. The Glion Dolly also made it onto our list of Best Electric Scooter for Adults due to it being such a great all round scooter. Read our full Imax S1+ review here. For a simple and smooth ride, the Imax S1+ is your scooter. 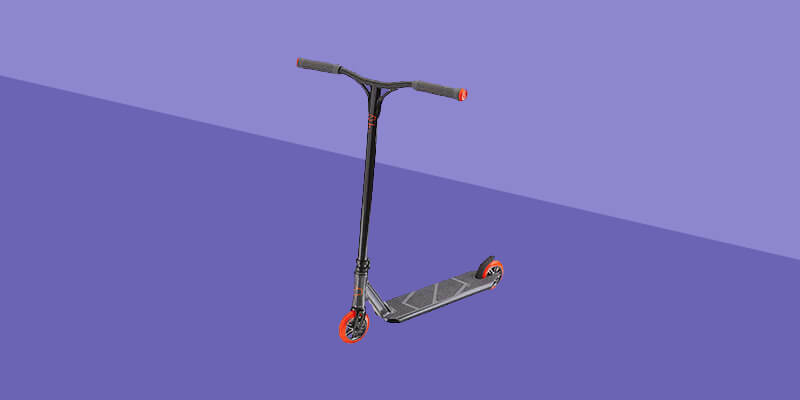 It’s small enough for anyone who doesn’t want to stand out from the crowd, or carry around a bulky scooter, while also providing a wide deck and large, solid tires. 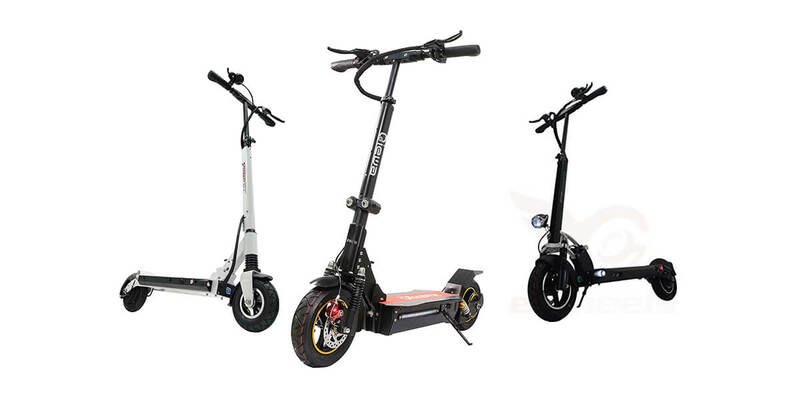 The 750V motor is a gearless direct drive rear hub motor, and the rear mechanical disk brake comes in at 140mm, which provides reliable safety when braking. The battery pack is 48V and 10Ah, this sort of power could definitely get you up a reasonable hill. At 10” the inflatable tires absorb shock from rough terrain, and the spacious deck accommodates larger feet. There is a brake activated LED backlight, as well as a headlight that comes on when you activate the backlight on the display. For the S1+, you are required to get a small amount of speed manually before you can activate the throttle, this reduces the strain on the battery however isn’t very helpful if you’re carrying a large load with you. I definitely feel confident about this scooter, it’s built well without coming across as bulky. The tires are robust, 10” x 2”, so the journey will be relatively smooth going across any cracks in the sidewalk. However these tires become a bit of a problem if you get a flat due to the process of replacing them, you basically have to take a section of the scooter off yourself. This scooter is on the heavy side, just about reaching 40lbs, but regardless I’d still use this on my commute to work and we’d highly recommend it to anyone. Read our full EcoReco M5 review here. The EcoReco M5 E-Scooter is an eco-friendly, portable and efficient scooter. It’s incredibly well made and has a few very nifty features that we don’t see very often. This includes a very nice backlit LCD screen and it even has a standard tripod mount so you can attach a GoPro or something similar like a phone mount. The EcoReco M5 is well built and has some good stats. It’s lightweight and can reach around 22mph with a 20 miles range. What is also great about the EcoReco M5 is that it has a very fast charge time. You can get from empty to 80% charge in 2.5 hours. It’s also foldable and will fold in 2 seconds. It folds very compact and will easily fit under a desk or by your side in the subway. Despite being very well made and having some great features, the M5 does have a couple of small drawbacks, for example it’s quite expensive and doesn’t have any lights or horns. These features can be found on many cheaper models and we’re surprised that they haven’t included them on the M5. Even though these drawbacks aren’t great, I’d recommend the M5 to anyone looking for a fast, effective and compact scooter that turns commuting from a chore into a joy. The super 36V Turbo 1000-Elite is a seated scooter manufactured by a California based company called Super Cycles and Scooters LLC, and we think it would work for commuters of all ages. It is ideal for the elderly due to its seat and good shock absorption, with dual shock absorbers. The 1000 Watt 36V motor runs at a speed of 3000rpm, the main reason this scooter can go at an impressive speed of 27mph. This product is great for all-terrain commutes, due to its wide 10.5” tires and dual rear adjustable shocks, giving it a smooth ride. It has many removable parts for easy part replacement, for example the seat is removable if you prefer to be standing. 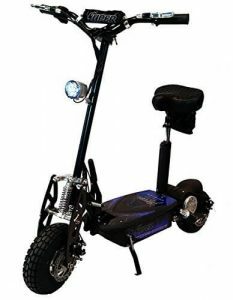 This scooter has a heavy duty chain, an LED headlight for night rides and front and rear disk brakes. 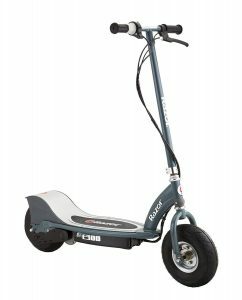 I’d recommend this scooter for anyone that feels they need one that can carry a heavy weight, as it has a weight capacity of 300lbs. An interesting feature is the Econo/Turbo mode, a button that allows you to decide what type of ride you want; Econo for longer journeys and Turbo for speed. Overall this is an impressive, powerful scooter that has clearly had a lot of work put into it. 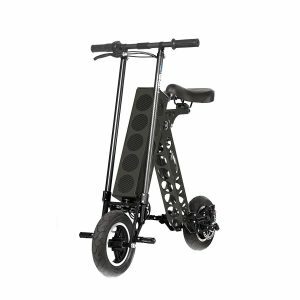 It will work well with steep hills due to good acceleration and powerful motor, and is great for carrying heavier weights with its 300lbs limit. This is also a smooth, comfortable, seated scooter which is why I’d recommend it to elderly commuters. The Super Turbo also made it onto our list of the best off road electric scooters because of it’s great performance when not on smooth ground. 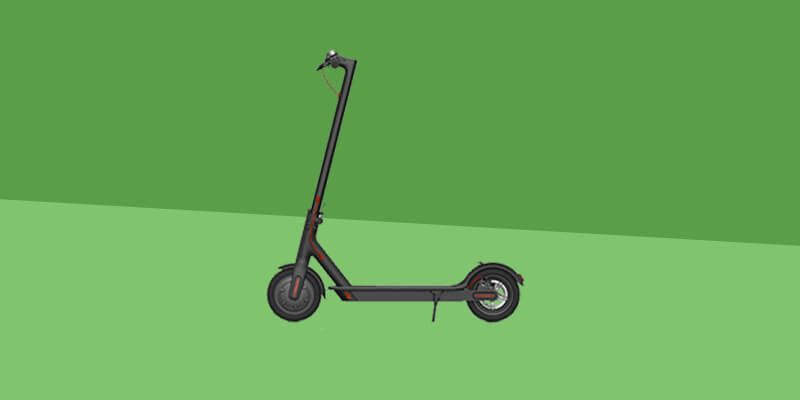 The OjO scooter is less like an electric scooter and more like a vehicle. With a wireless key fob, a motion activated alarm and state of the art front and rear LED lights, this scooter rightfully belongs in the bike lane rather than the sidewalk. Designed and built in Santa Monica it fits perfectly between a standard kick scooter and a full sized motorized scooter/moped. It’s fully legal to be ridden in bike lanes and doesn’t require a licence. We recommend checking local riding laws and regulations before buying though. The OjO has a huge range of very interesting features. For example, it has a fully aluminium chassis that is fully waterproof with a headlight, tail light, horn and both front and rear disc brakes and full suspension. It also has a patented onboard charger with a retractable cord and plug that can fit any 110V wall socket. It also has a non glare screen for all the information you need when riding and even two waterproof Bluetooth speakers and a USB port for charging your phone. The seat is removable and there is also a removable basket that you can purchase. The tires are all weather pneumatic, tubeless and motorcycle grade – perfect for optimal, road-gripping performance. 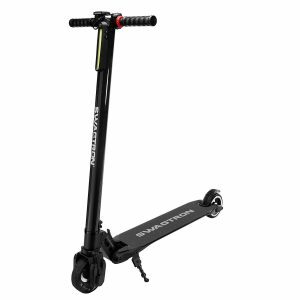 Again I’d recommend this scooter for anyone that feels they need one that can carry a heavy weight, as it also has a weight capacity of 300lbs, same as the Super 36v Turbo 1000-Elite Electric Scooter. We love the OjO and see it as the benchmark for new electric scooters with its originality, design and feature set. Many people would see the price as an issue, and we can’t deny that it will cost around 4 times as much as the Super 36v Turbo 1000-Elite Electric Scooter. However we see this as an investment, and ultimately very well priced when compared to traditional mopeds, with multiple benefits over them. For example fueling the OjO is basically free due to it being chargeable, it’s much more environmentally friendly and you don’t need a license to run it, so it’s much easier to hop on and go for your commute to work. For a more detailed look at the Ojo check out our full review. Hi, I have Swagger for 6 months now. I think that is best options on market currently if you take quality and price. Nice article and Thank you for sharing with us.